I have a love hate relationship with Pottery Barn. They have really cute stuff, but they are such a total ripoff in the price department. I have had a gift card in my purse to PB for almost 2 years now I refuse to spend it since every time I go in I think "I could make that" or "That is a pretty generic piece of furniture, I will hold out and find it on sale somewhere else." 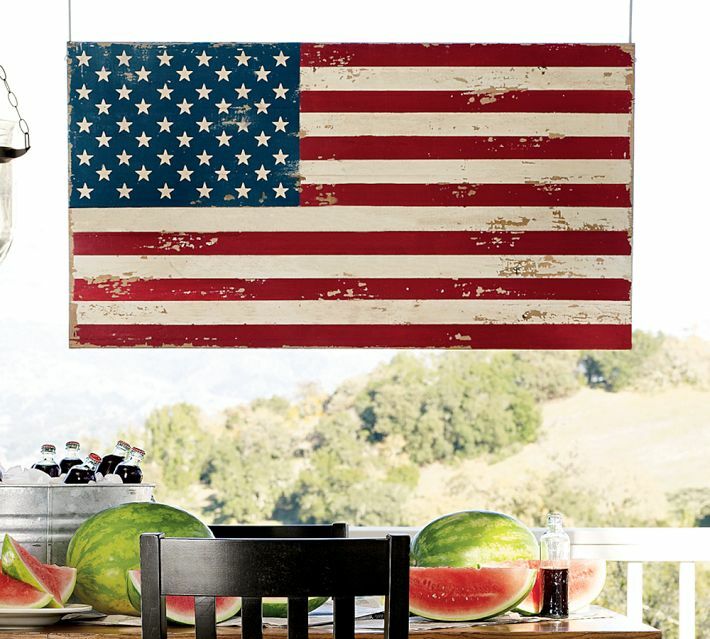 Yeah, it is a really cute flag.. but ya know.. they want ONE HUNDRED AND THIRTY NINE DOLLARS for it! I diluted brown paint I used on my kitchen table and glazed the entire board to give it an aged look. 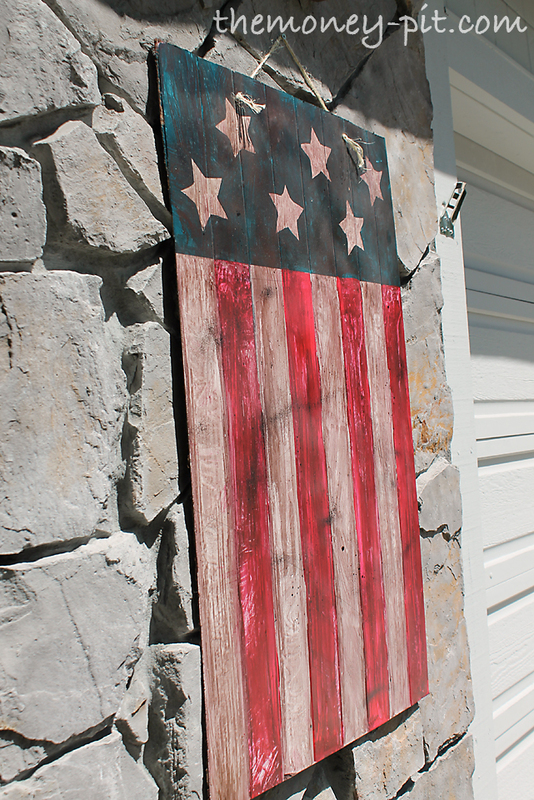 I also splattered it with a little oil rubbed bronze spray paint. Not bad for an afternoon of work. Total cost: ZERO! Yeah, I can't get behind paying for stuff in pottery barn. But I love to steal their design ideas-- though I only remember them around Christmas. 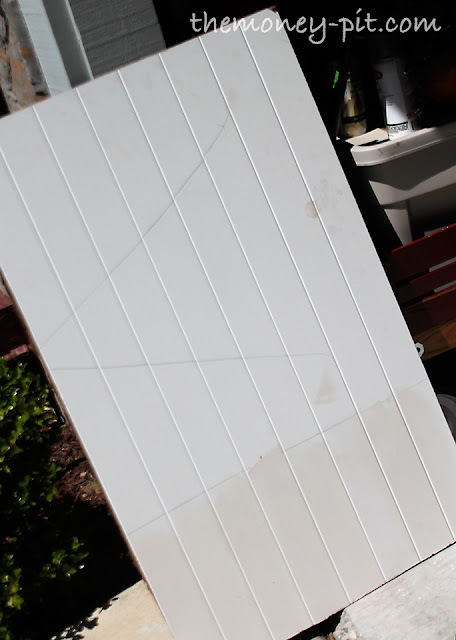 They were charging $69 bucks for some North Pole/Santa sign thing that I made out of the back of an old wooden puzzle for free. Silly pottery barn. And that beadboard is perfect for the straight lines. Double bonus for having the kids help! Love it! I am going to make one for the 4th of July! Totally love how yours turned out and even better that you made it for free!! I love pottery barn too nut its totally crazy how expensive their stuff is. However I love getting their catalogs and finding decor inspiration in them. I love it! 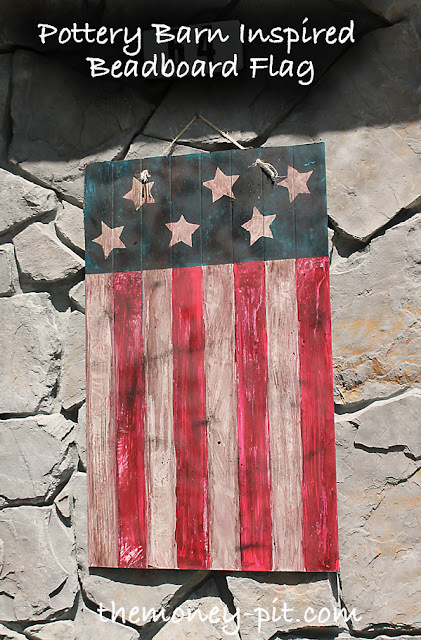 I have been on the search for something fabulous to hang on my door for the 4th and I think this is just the ticket. Plus I have some bead board just sitting around as well! I am definitely going to do this project! Thanks for sharing! Hi!! Saw that you linked up to the Bloggy Olympics!! Yay...high fives!! So glad to see you there! This is AWESOME!! I believe we even have some left over beadboard in the garage. 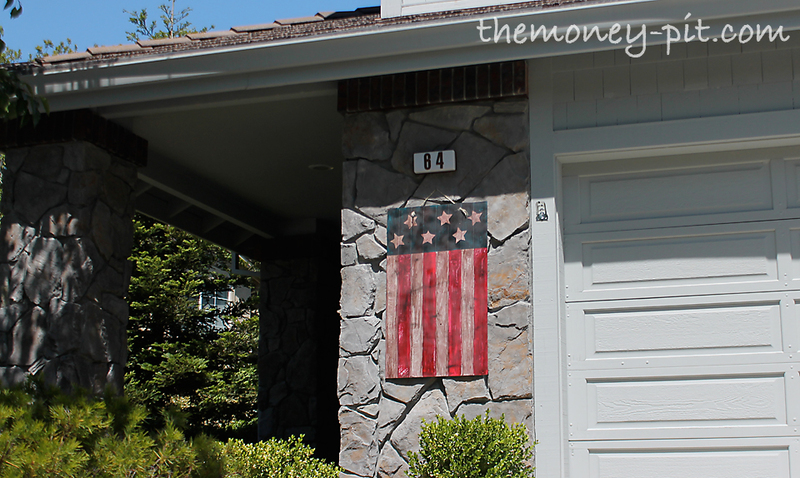 This is something to stay up year round, not just during independence day. Thank you for sharing! This is great! 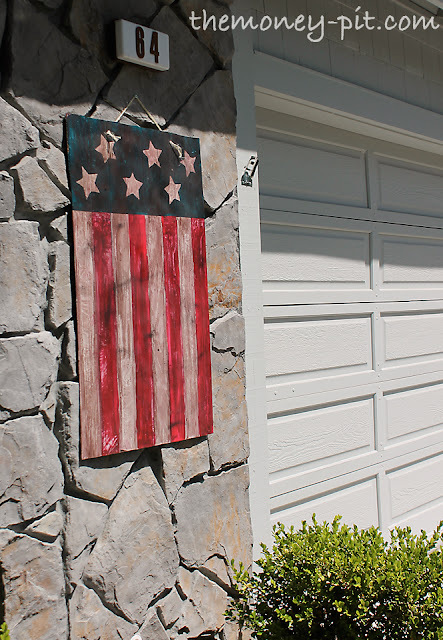 I love all the fun red, white and blue projects starting to pop up in blogland. I hope you will link up to my Patriotic Project Parade. Very cute Kim - love the rustic look! And I think yours is WAY prettier than the PB flag! They are ridiculously expensive - I agree completely! Thanks for sharing! SO COOL! I'm loving all your projects lately. I'm featuring this one tonight :) Thanks so much for linking at Once Upon a Weekend! Looks great!....and for zero money spent its even BETTER!